Six years ago, on 19th May 2009, with the official declaration of the elimination of the savage terrorist leaders and the victory over Tamil terrorism, the spontaneous expression of overflowing thrill, ecstasy and gratitude by the ordinary people across the country, was overwhelming. Lighting of fire crackers, ringing to temple bells, large-scale preparation and sharing of ‘kiribath’ were some of the obvious reactions. 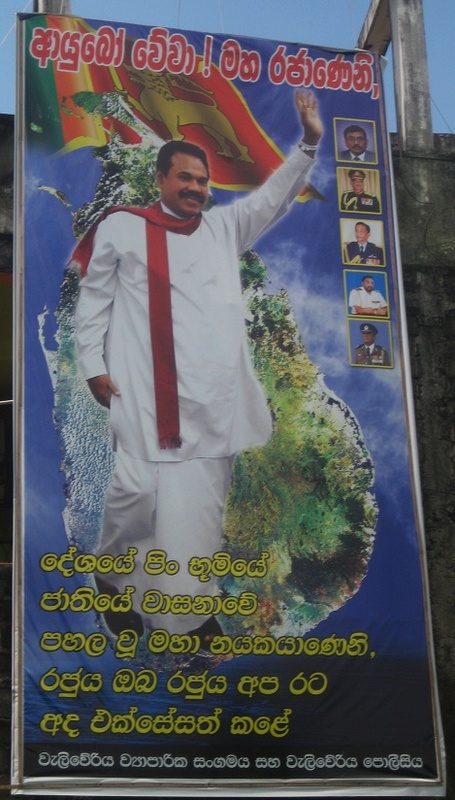 Our national anthem in Sinhala and Sinhala patriotic songs were played loud on loudspeakers. A most visible form of people’s spontaneous reaction to this great victory over terrorism that plagued our nation for some three decades, was well evident across the country, most strikingly in our roadside environment which was adorned with a multitude of large banners, posters and cut-outs expressing vividly the overflowing joy and gratitude of our people to those who brought them peace. Inquiries made on site, revealed that this was an impulsive, unprompted, heartfelt and genuine reaction of ordinary people and caring individuals, families, businesses, youth organizations and non-political community groups. The world’s most savage and brutal terrorist organization banned internationally by 32 countries had been finally defeated on its own home turf, by our gallant ‘Ranaviru’ patriots. The following are a few of the many highly conspicuous, colourful, large vibrant screen-print posters put up on trees, buildings, fences, across streets and on posts planted even within paddy fields in most rural and urban locations across the country. Thousands of large banners and colourful posters sprang-up in most municipalities and towns. 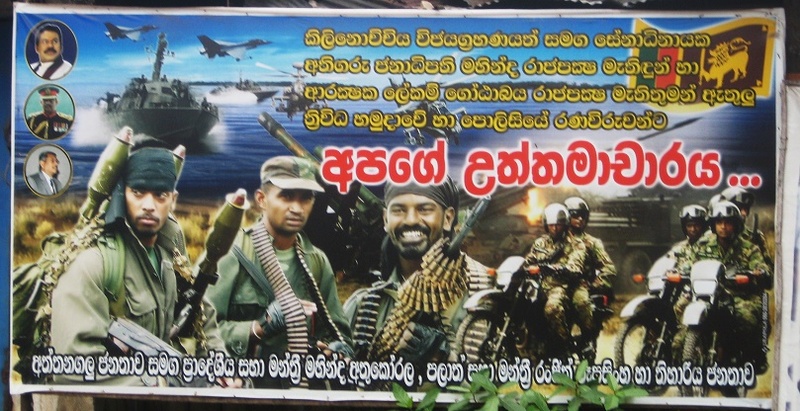 These pictures in fact, are a small representative sample of the visible roadside culture of post-terrorism Sri Lanka. We learnt that most of these large size colourful screen-prints were designed by youth in the locality, free of charge. They were also responsible for displaying them in prominent places. What is most prominently evident are real pictures of our gallant Army, Navy, Air Force and STF personnel, especially of those heroic ones who sacrificed their lives in fighting to save our nation from Tamil terrorists, so that peace and stability would prevail in our motherland. The background of most of these banners depicted military hardware and themes symbolic of the historic victory of our armed forces. All invariably, are reflective of the overflowing admiration people have developed towards the valiant Army, Navy, Air Force and the STF. Some were meant directly to evoke a high degree of patriotism among people. 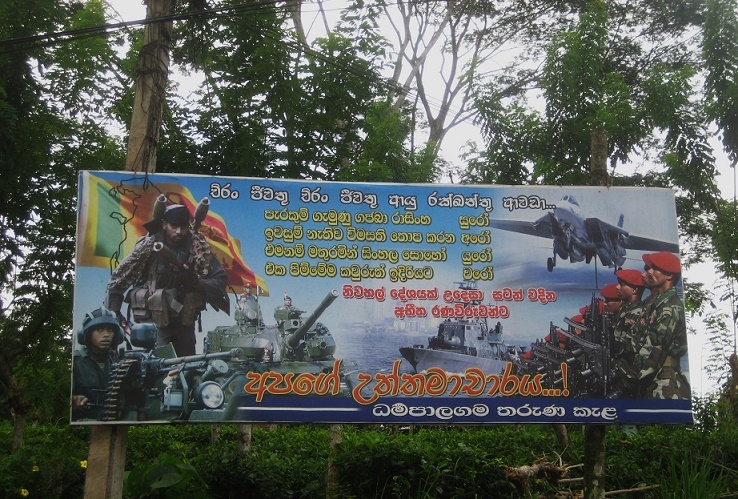 Most banners and posters highlight the picture of the President Mahinda Rajapaksa, the Secretary of Defence Gotabaya Rajapaksa, the Military leadership and our National Flag. It was a glorious and a most momentous time in the recent history of our nation which was an overwhelming experience for those of us who were privileged to experience it. We will never let down those who brought us peace, those who saved our nation from Tamil terrorism.